Mobility scooters outnumber powered wheelchairs in Canada by almost 2 to 1 and are still gaining popularity. These mobility aids are relied on by people with disabilities year round to help with daily activities like going to medical appointments and shopping. But little is known about the safety and effectiveness of scooters in winter conditions, and current standards for scooters do not require testing in winter conditions. 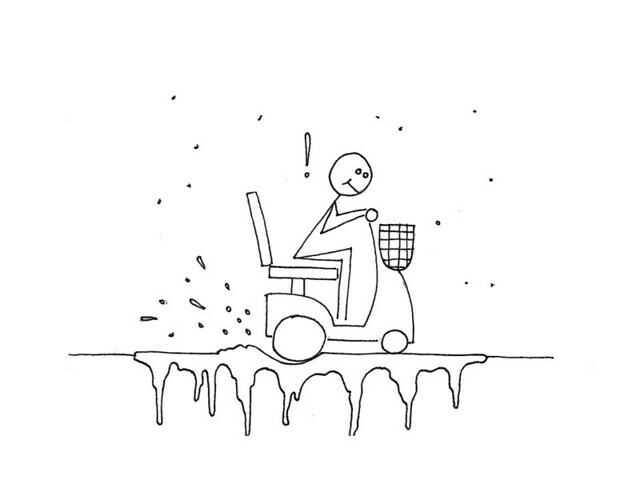 In fact, most scooter manufacturers recommend against using scooters in snowy, icy or even wet conditions. To develop a method to evaluate the performance of scooters in a realistic winter environment. All testing will be conducted in the climate-controlled WinterLab at the Toronto Rehabilitation Institute. The ultimate goal of this work is to design a better scooter by balancing the needs for indoor maneuverability with outdoor stability and the ability to travel over snow and ice. We plan to reproduce realistic winter conditions indoors at Toronto Rehab’s WinterLab in an effort to create test methods that can be used regularly in future testing. In our testing we plan to make a 5 meter long track which is hooked up to instruments that measure force and motion, and with the data we collect from these instruments we will calculate how well the scooter performs in various conditions. One expected outcome of this study is the development of a set of reproducible methods to create realistic winter surfaces. We will also gather information about how well one scooter performs on these surfaces. This will be the first study to evaluate the safety and effectiveness of scooters in winter conditions, and it is also the first phase of a larger initiative at Toronto Rehab to improve scooter safety, performance and design.